The next step is the block construction. The most common construction method I’ve seen for the asterisk block starts with a square that you cut corner to corner and insert the black strips. Instead, we’re going to strip piece the + block, then cut the diagonals. 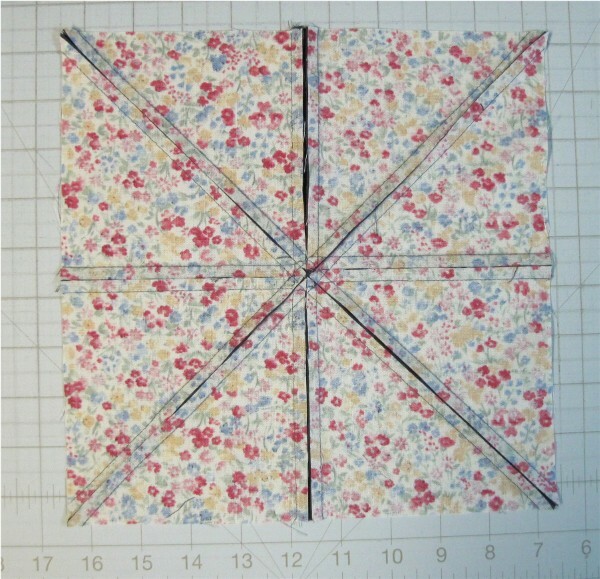 If you’re making a lot of identical blocks, this is especially easy because you can sew entire width-of-fabric strips together. Each block size is constructed exactly the same way. The largest block uses larger “iron” strips, while the two smaller blocks use 1/2″ finished (1″ cut) strips. I tried using skinnier strips for the smallest block, thinking that the proportions would look better. They did, but the block was much more difficult to construct because the seam allowances overlapped. When I switched to the 1/2″ finished (1″ cut) strips, the block went together easily and it still looks good. We’ll start with the 9 1/2″ blocks since both quilts use this size block. This uses the 5″ strips of colored fabric. If you’re doing the small quilt, cut all of your 5″ strips in half so you have two 5″ wide strips that are 10″ long (or slightly longer). This is indicated by the blue line on the cutting diagram. 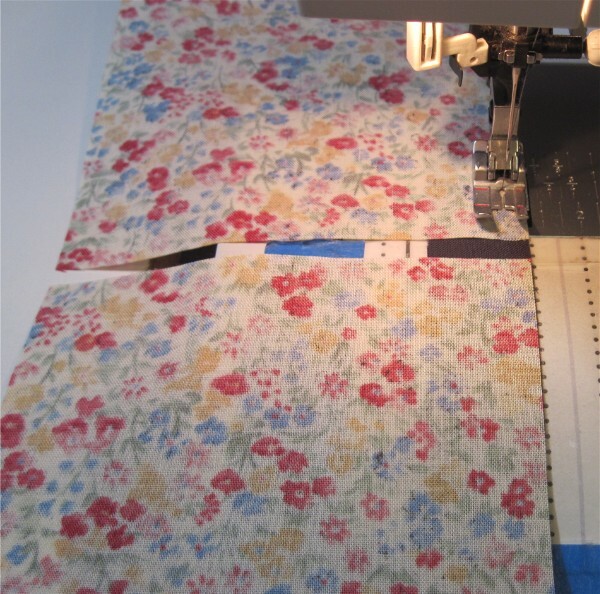 If you’re doing the large quilt, cut the 5″ strips for fabrics B – E into two 5″ wide strips that are 20 – 21″ long (blue line on the cutting diagram). You may have a little excess fabric left over from the strip – you can discard the extra. Fabric A is slightly different in the large quilt, since you need to make an extra 9 1/2″ block in that fabric. 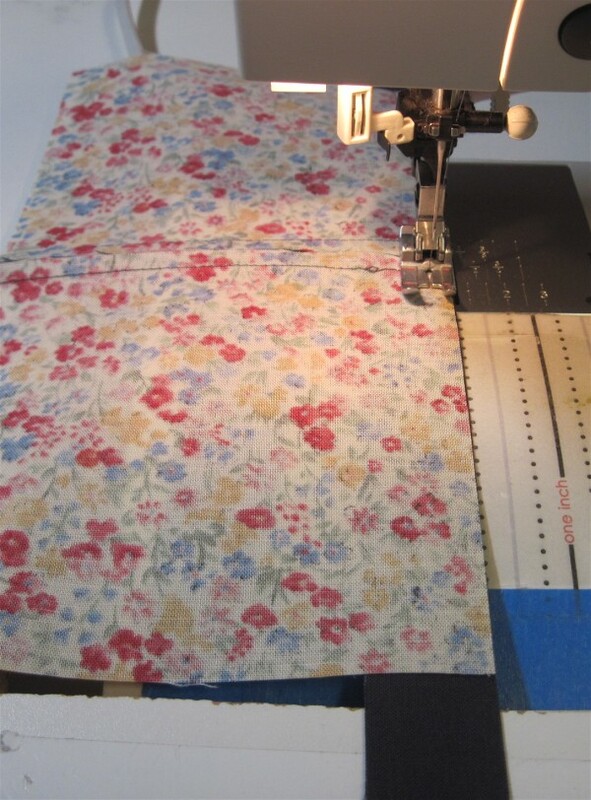 For fabric A, cut the long strip into three 15″ segments. The small 5″ strip should also measure 15″. Place a black strip right sides together with one 5″ wide colored strip. Sew along the long edge until you reach the edge of the colored strip, then place another (different) colored 5″ strip with the black strip, leaving a small gap between the colored pieces, and continue sewing. 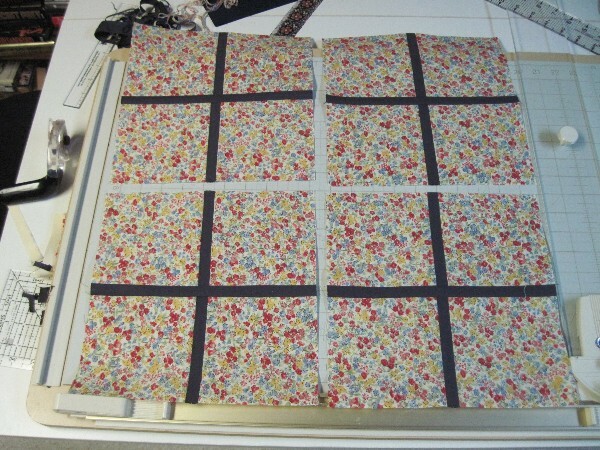 You should be able to fit two 20″ strips (large quilt) or four 10″ strips (small quilt) on each black strip. 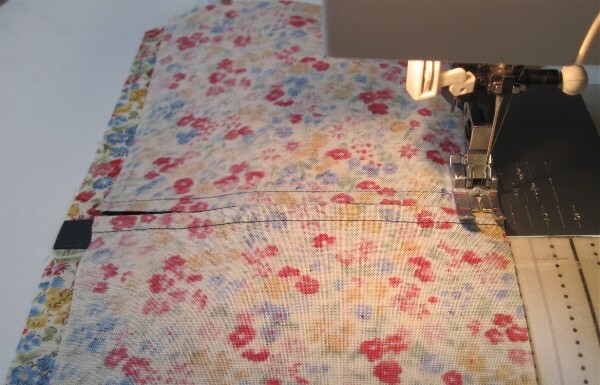 By sewing these long seams, you’ll save a little time over sewing smaller individual pieces. Remember, you are only sewing HALF of the colored strips to the black strips! Press toward the black strip, then line up the edge of the other 5″ piece in that fabric and sew it to the other side of the strip. I like to keep the black side on top so I can control the seam allowance. As you can see (below left), the edge of my sewing machine foot just catches the seam allowance from the first seam. This can cause the fabric to be pushed slightly to the side, which throws your block off. Instead, lift the seam allowance so the foot runs under it. Press toward the black strip. Because this block has such close seam allowances, you need it to fit together just so. I found that pressing the fabric, then spraying it lightly and gently pressing again gave a crisp, flat edge that helped maintain an accurate seam allowance. You can use plain water, spray sizing, spray starch, or my favorite concoction of 3 parts water to 1 part vodka. Yes, I said vodka. Be careful not to scrub across the fabric with the iron as this can distort it. Just gently press, guiding the seam allowances flat with your other hand. I also found that pressing from the back worked better, especially for the smaller blocks. 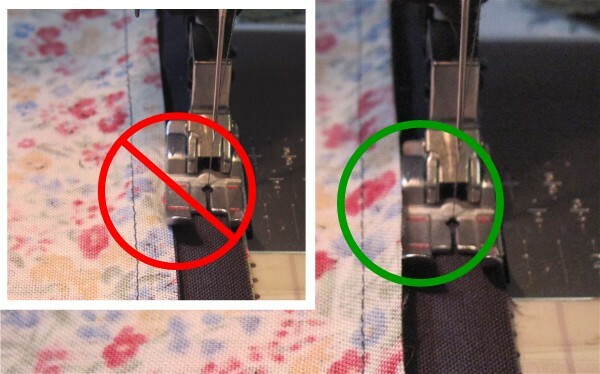 The two seam allowances should lie flat, without any overlap. After pressing, cut the strip set into 5″ sections. Sew half of the sections to a black strip, just as you did in the first step. Be careful crossing the seam allowances so they don’t flip back and get caught by the needle. As before, leave a small space between the segments. Make sure the segment fits on the black strip before sewing – you don’t want to sew half of the piece on and realize that the black strip is an inch too short! When half of the sections are sewn to the black strips, trim them apart. Sew the second segment to the other side of the black strip. Spend a little time here lining up the center strip. You might even choose to pin here. I did on the largest blocks. You will end up with cross blocks. Although the photo below shows four identical blocks, this was just my practice session to see how the construction method worked. You should have one of each color if you’re doing the small quilt, and two or three of each color if you’re doing the large quilt. The blocks are not done – we still have to do the diagonals – but this is a good stopping point. Go ahead and sew all of your 9 1/2″ finished blocks to this point, then continue using the same method for your larger or smaller blocks. 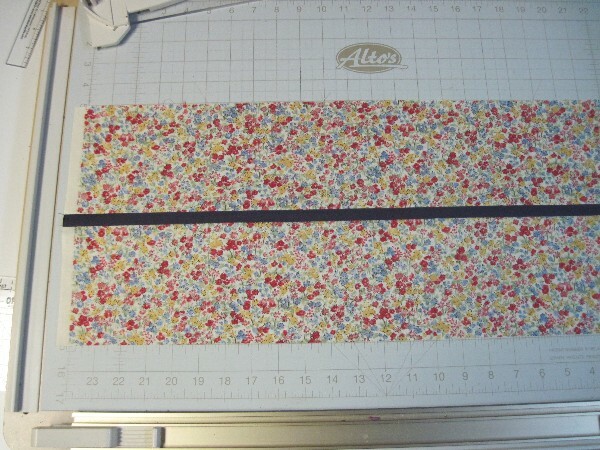 For the large quilt, follow the same steps with your 10″ wide colored strips, this time using 1 1/2″ cut black strips. When you cut the strip set into segments, cut them at 10″. 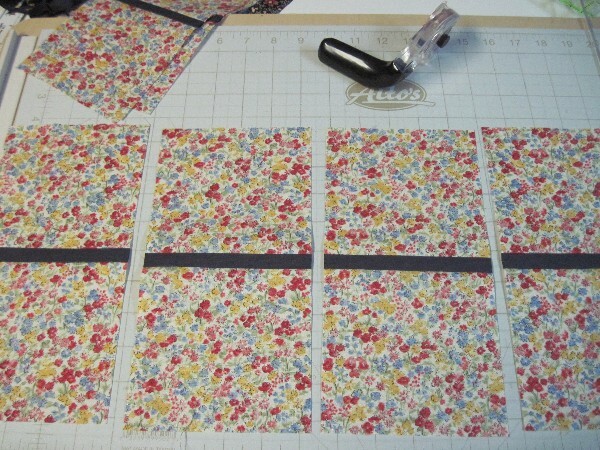 For the small quilt, follow the same steps with your 2 1/2″ wide colored strips, again using 1″ cut black strips. The smaller block requires a little more attention. 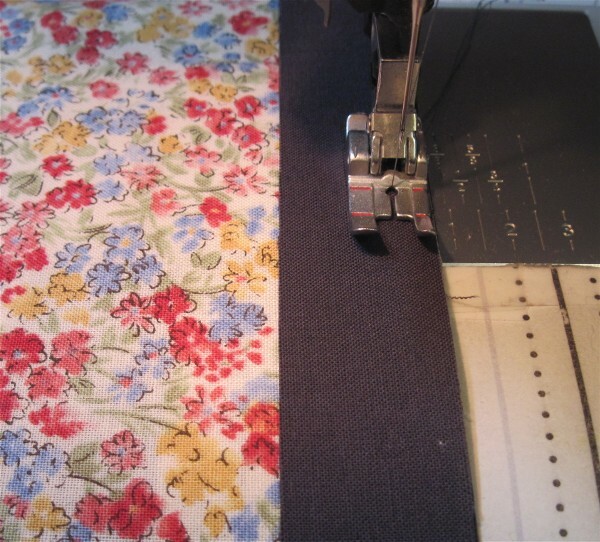 Sew scant quarter inch seams (a thread or two less than a quarter inch) and be diligent in your pressing. 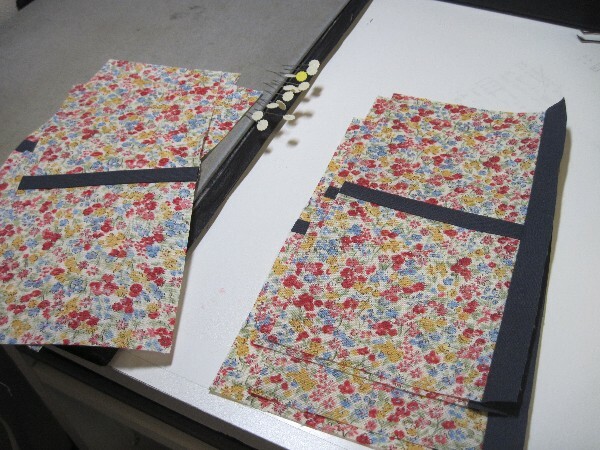 The first time I pressed the small block seam, it overlapped and I thought it was a disaster. I tried pressing it again from the back using a little misting of vodka water and it made all the difference – the block laid perfectly flat and the seam allowances did not overlap. When you cut the strip set into segments, cut them at 2 1/2″. I’ll be back this week with the diagonal step for block construction. It’s fairly obvious, but I have a couple of tips that will help with accuracy. As I have come to expect, your instructions are completely fabulous and concise,and the accompanying photos are very helpful. I will be starting as soon as my fabric arrives on my doorstep! Thanks again for doing this, Sandi. I am behind since my husband’s mishap last week, but I will catch up in due time.